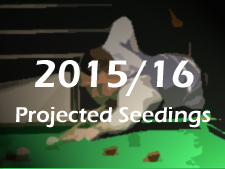 The penultimate day of the 2013 World Championship qualifiers today saw six of the 16 qualifiers confirmed, as four players successfully qualified for the Crucible for the first time, including Jack Lisowski pictured above. 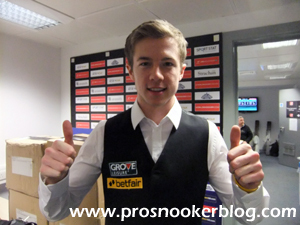 Having reached his first full-ranking event quarter-final at the recent China Open, Jack Lisowski came into this week’s World Championship qualifiers as one of the tournament’s fancied men and duly delivered today, with a 10-4 victory against veteran Fergal O’Brien. Early on however, the match appeared as though it might be far closer, Fergal opening up a 3-1 lead at the mid-session interval, the first two frames in particular taking some time to complete. From there though, it was Lisowski who took control, breaks of 87, 114, 131 and 67 in successive frames helping him on the way to a 6-3 lead at the end of the first session. As they resumed in the evening, Fergal took the first frame to ensure that there would be a mid-session interval, but Jack was not to be denied and finished with further breaks of 100 and 56, to seal his place at the Crucible for the first time. As Jack headed into the tournament office to face the media (well, Hector Nunns, John Skilbeck and myself), it was clear from both his words and demeanour that whilst obviously pleased to qualify for the tournament, this was a man for whom the job was not yet done. Jack clearly has total belief in his ability and will relish the opportunity to make a name for himself on the biggest stage of all next week. Joining him at the Crucible will be Ben Woollaston, the Leicester man booking his place in Sheffield with a 10-9 victory against experienced Welshman Ryan Day in the final match to finish this evening. It was a close match throughout as the pair traded century breaks early on, runs of 138 and 100 from Ben, preceded by a break of 139 by Ryan, but as Day got his nose ahead at 9-8, it appeared as the 2012 quarter-finalist would prevail. Ben though had other ideas, taking the match to a decider, before making a break of 64 on his way to sealing qualification with a brilliant long red. It has been a strange season for Ben, during which he has won just two matches in full-ranking events, yet been among the most consistent performers during the PTC events, eventually making it as far as the last eight of the Grand Finals in Galway. As he explained following his win however, this win marks a dream come true for him and he was clear after the match that he would now like to paired with Ronnie O’Sullivan in Monday’s draw, not a hope that will be shared by too many of the qualifiers I am sure. 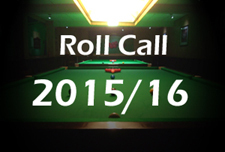 While I always strive to be impartial on this blog, something that is generally very easy to do as I like to think that I get on with most, if not all of the players on tour, I have to say that on a personal level I am thrilled that both Jack and Ben will be among the 32 players at the Crucible this year. 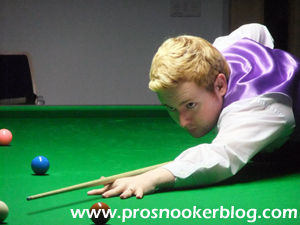 Both have supported the blog for a number of years, Jack since I met him at the Paul Hunter English Open back in 2009 while he was still an amateur competing in the PIOS, while I also met Ben at that tournament and have followed his progress since. I hope that both will be able to do themselves justice at the Crucible and that those of you at home who are perhaps not so familiar with them, will be able to see just how talented they are. Elsewhere, both Michael White and Thailand’s Dechawat Poomjaeng were also able to qualify for the Crucible for the first time, running out comfortable winners against Andrew Higginson and Jamie Cope respectively. Speaking to Dechawat after the match, his English was not the best (though in fairness, far better than my Thai! ), but he was able to describe his qualification as ‘very nice’ and as to how pleased he was with his second season on the main tour, in comparison to his first. He also spoke of the influence that James Wattana has had on his career, describing him as like a big brother and a teacher to him. He explained that the Thai players on tour all live together and that not only has Wattana’s success helped to publicise snooker in Thailand, but he has helped players like Poomjaeng to settle in the UK and is clearly a big influence on all of the Thai players. 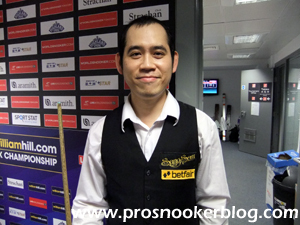 Dechawat also explained that his nickname is in fact Jack, as he is known in Thailand, while he does not want to draw either Ronnie O’Sullivan or practice partner Ding Junhui at the Crucible, describing them as ‘too hard’ for him! Welshman Michael White meanwhile like Jack Lisowski came across as being in control of his emotions and calm, given that he had just qualified for the world’s biggest tournament for the first time. He explained that the run of close friend Jamie Jones in 2012 is something that has inspired him, not just this week, but all season, and that it meant a lot to him to play as well as he did and to beat a player as good as Andrew Higginson 10-4. Elsewhere, Michael Holt was able to progress this evening, surviving a real scare as Mark Joyce battled back from 8-0 down to close to 9-7 at one stage, before Holt produced a fine break under the circumstances with all of the reds in the baulk half of the table to all but get himself over the line. Joking that suicide was an option at one stage as he got changed after the match, the Hitman can now look ahead to a sixth appearance at the Crucible and his first since 2010. 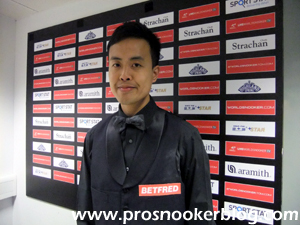 Also returning will be Marco Fu, who pulled away against David Gilbert in the evening session to come through a 10-6 winner, for me underlining his status as probably the most dangerous qualifier in the draw and one who the likes of Ronnie O’Sullivan would do well to avoid. Following the afternoon session meanwhile, the four matches which started at 2:30pm are all very well poised heading into tomorrow, Tom Ford and Liang Wenbo both bouncing back from 5-2 down to close to 5-4 at the end of the day, while Ken Doherty also won the final two frames of the session to close to 6-3 against Matt Selt and keep himself in the tournament. Perhaps the latest finish however will be that between Martin Gould and Rod Lawler, who were able to complete just six of their scheduled nine frames today, thanks in part to a 59 minute long opening frame, eventually won by Lawler. Leading 4-2 overnight, Rod heads into tomorrow with the advantage, but has a long way to go yet if he is to make it through to the venue. Oh, and Jimmy White will be in action tomorrow too. It promises to be a grandstand finish, to a thoroughly enjoyable week of qualifiers at the EIS, for those of us watching at least!